The Natural Color Cotton Group — NCC Ecobrands carries out work with Brazilian DNA in which traditional techniques associated with design create a bridge between Culture and the Creative Economy. Among this Fashion Group’s motivations, there is the use of Crafts— which are part of Brazil’s cultural heritage—with design innovation and the use of new materials. The designer Francisca Vieira explains that “the basis of creation is the use of threads and natural fiber fabrics such as organic color cotton and ecological silk” she says. Among the traditional techniques used are Renascença (renaissance lace), Frivolitê (frivolité lace), Tenerife (Tenerife lace), Rede de Pesca (fishing-net lace), Filé (Fillet lace), besides Macrame, Crochet and also Capitone. For the designer, the renaissance lace is one of the most beautiful in Brazil and its production is strong in Paraíba. In 2013, the lace from Cariri in Paraiba received the Seal of Geographical Indication (GI). The technique the renaissance lace is included in the category “needle lace” and has several knots. For over a decade, the Natural Cotton Color group includes the renaissance lace in their collections: in clothes and accessories such as handbags and shoes. The Renaissance lace is the favorite. It is in various collections, since the creation of the Natural Cotton Color brand, 15 years ago. The frivolité lace was already endangered of disappearing, but production resumed and there is already a law being processed in Congress for it to become Intangible Cultural Heritage of Pernambuco, especially for the production achieved in the municipality of Orobó. Made of small knots with cotton thread, this lace is produced with “navette”. It has only a basic knot in circular format. With every knot comes a beautiful new design. Frivolitê: in 2011 we use on some dresses. The technique should be listed as Intangible Cultural Heritage of Pernambuco, northeastern Brazil. The fillet lace is listed as intangible heritage of the state of Alagoas, northeastern Brazil. The Tenerife lace, also known as Nhanduti or renda Sol (Sun lace) originated in Paraguay as it derives from the embroidery ” Tenerife Roses”, from Spain. It is produced using a round disc where guipir knots are tight. Its production is still very limited in Brazil, but there is an effort to rescue the technique in the Southeast. There’s even a collaborative virtual museum in Atibaia, São Paulo, dedicated to Tenerife lace. The Tenerife lace is made with a round disc where guipir knots are tight. The fishing net is a return to the origins of the lace itself. According to studies, it was from the fishing net that all handmade lace – even the most sophisticated, appeared, all created in coastal regions of Europe. (We will give the details in another post). The idea of ​​inserting the Fishing Net in some dresses began with the designer from the Romero Sousa group using as inspiration the tarrafa fishing net in a collection of Comparoni bags. The designer Francisca asked a fisherman to develop the net, replacing the nylon with organic color cotton fabric strips. In this way, she created a delicate and contemporary product used in Natural Color Cotton’s pieces. Fishing net: inspired by the fisherman’s cast net, we replace nylon with organic color cotton thread. In the case of Macrame – a technique of weaving through crossing threads with your fingers – the group has invested in a seducing the eye by recreating the lace mixing the basic double knot with the festonê knot. The macramé is made with fingers and has two basic knots: the double knot and festonê knot. 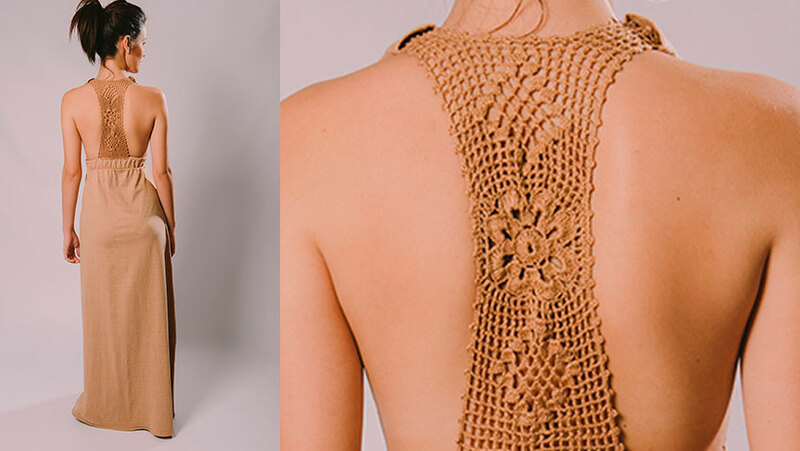 Crochet, made with a hook-shaped needle, is part of the range of techniques used by the Natural Cotton Color Group, always with organic color cotton or silk threads. Crochet is part of the range of techniques used in pieces in various collections. The Capitone, is a technique originated in England, also part of the Natural Cotton Color group techniques. The fabric is divided by knots made with yarns that form square or rectangular protrusions. Depressions generate a volume and a surprising aesthetic texture. The Capitonê — a feature of nineteenth century and the 50s and 60s furniture—enters the Fashion, through organic color cotton fabric. For the designer Francisca, the value of traditional craftsmanship with innovation through design and new materials brings enchantment. The result always excites: “The Capitone, a feature of nineteenth century furniture – redesigned in the 50s and 60s – migrates to the clothes and accessories. This hint of classic design revisited in our sustainable Fashion, brings sophistication and timelessness. We love it.”, Francisca concludes.